Can Scientists Use Stem Cells to Grow a Human Heart? Many seniors currently live with cardiovascular diseases with help from Oshkosh at-home caregivers and require transplant surgeries. With cardiac muscle tissue already being harvested from pluripotent stem cells, researchers are looking forward to the day when they will be able to grow an actual beating heart suitable for transplantation purposes. According to a study published in the March 2016 issue of Circulation Research, that day may be coming soon. Years ago, a medical research team combined 3D printing technology with biological material to manufacture an organ that resembled the basic heart anatomy minus the cardiac tissue. This project motivated stem cell scientists to bioengineer embryonic cells so that they can be stimulated to develop into cardiac tissue. 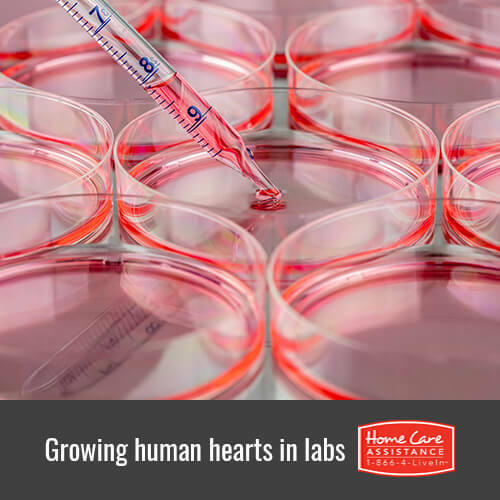 Embryonic heart tissue harvested in the lab has already been used for pharmaceutical testing purposes. In recent months, however, these lab-grown cardiac cells were injected into the aforementioned heart structure produced in a 3D printer. Using chemical nutrients and mature skin cells, researchers were able to stimulate the embryonic cells to grow into an organ that resembles a heart in the process of development. The most exciting moment of the project involved sending an electrical shock to the lab-grown organ, which started beating like a functioning human heart. Although it is still too early to think about lab-grown hearts being used for transplantation procedures, researchers and Oshkosh home care agencies are optimistic about the potential use of stem cell therapy for cardiac patients. This research into embryonic heart muscle creation by means of stem cells inspired a medical team at Cincinnati Children’s Hospital Medical Center, where Caleb Sizemore, a teenager suffering from congenital heart scarring, received an infusion of stem cells directly into his heart. Doctors are hopeful that the scarring of Caleb’s heart tissue can be reversed to a healing extent with stem cell therapy, a procedure that could potentially be applied to many other patients. Living with and recovering from heart disease can pose a serious challenge for seniors who live alone. To combat these challenges, Home Care Assistance of Oshkosh provides flexible live-in and hourly home care for seniors. In addition to helping our clients manage cardiovascular disease, we also provide comprehensive Alzheimer’s, dementia, and post-stroke home care in Oshkosh. Contact us at (920) 710-2273 to learn more about our services and schedule a free in-home consultation today.